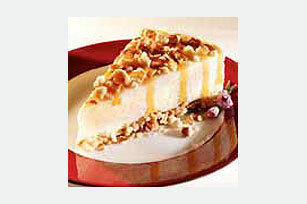 Vanilla ice cream sandwiched between layers of chopped shortbread cookies and pecans is drizzled with caramel topping for a luscious frozen dessert. Sprinkle half of the cookie pieces onto bottom of 9-inch springform pan; top with half of the pecans. Spread ice cream evenly over cookies and pecans; sprinkle with remaining cookies and pecans. Drizzle with topping. Freeze at least 4 hours or overnight. Store leftover dessert in freezer. Enjoy a serving of this cool dessert on occasion. Spread in single layer on baking sheet. Bake at 350°F for 5 to 7 min. or until lightly toasted.